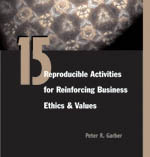 This book holds 15 simple to-utilize exercises that could be utilized separately or all in all to strengthen your organization's morals and qualities. Also helps workers to recommit to mindful business conduct. Individual employees, teams, and groups will participate in engaging role plays, discussions and case studies to: Better understand the importance of ethics in all aspects of life Explore their personal beliefs and values concerning ethics Examine the role that ethics and values play in business Each activity: Focuses on a unique concept or principle. Comes with helpful tips for presenting it. Incorporates questions that you can review with employees after they complete the activity Samples of real-life ethical situations addressed: An employee who uses the copy machine for personal reasons. A sales rep who makes promises to a potential customer about extra services that the company will provide to get their business. A government purchasing agent who awards highway construction contracts to a firm that just happened to be building a new home for him. A CEO of a large corporation who accepts a multi-million-dollar salary incentive bonus for a year in which the company lost an unprecedented amount of money forcing layoffs of 30 percent of its employees.